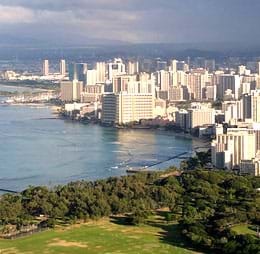 Honolulu city is the capital of a state of Hawaii. It is on the island of Oahu. It is the largest city in Hawaii and also a major sea port. Being the home for the world-famous Waikiki beach, the city is considered as the prime destination for beach lovers. Also, Honolulu is the doorway for the state Hawaii, bounded by the volcanic mountains, warm weather, electrifying shopping and nightlife, swimming and surfing, and home for numerous archival, cultural marvels, and war memorials like Pearl Harbor. Book your flight tickets with Rehlat – One of the fastest-growing online travel companies in the Middle East to get more offers on your Honolulu flight booking. There are some great Honolulu Attractions to discover, experience, and remember when visiting Honolulu! From the simple pleasures of visiting the popular Waikiki Aquarium and the Honolulu Zoo, to swimming with the many colorful Hanauma Bay Oahu fish, there are some wonderful Honolulu Attractions worth discovering. Once you’ve had enough sun & sand and need a little break, and looking for other things to do in Oahu, you can learn some of Hawaii's history at Pearl Harbor, the Iolani Palace Honolulu, and the Bishop Museum. If you’re going to spend time shoppingi Honolulu, you’re in for a fun adventure. You are guaranteed to find whatever it is you are looking for and then some! The best Honolulu shopping can be found in both indoor and outdoor settings. You will find a diverse mix of shops specializing in Hawaiian specialty items, island art, high-end designer goods, local crafts, and as much Hawaiiana as you can muster. Whatever you are looking for, you will be able to find it at the following Honolulu shopping venues: Ala Moana Mall, Ward Warehouse & Ward Centre, and of course, the Aloha Stadium Swap Meet. Honolulu gives you different dining experience than other beach cities. Here you can find the plenty of chain of restaurants from ‘Zippy’s’ and ‘Genki Sushi’. Zippy’s serve the delicious local cuisines in the Hawaiian way. ‘Chili’ is their traditional culinary, which is served in numerous ways by the restaurants. ‘Genki Sushi’s are Japanese based culinary serving restaurants. Their ‘Sushi’ is the favorite for tourists, and you will surely enjoy the Japanese ambiance. After the sun melts into the Pacific, the stars come out, and the Honolulu nightlife comes to life! It’s really all about the Honolulu nightlife & Waikiki for the most part. In order to get around the city, you will have plenty of options. However, in the muddled road system of the city, you need to know the navigations well before starting to hit the visiting. You have Buses, Rail, Taxies, and Cars in the city for roaming. Buses are cheaper than any other option, and they are very comfy in terms of reaching the destinations. Taxies and Cars will be available 24/7 at all the corners of the city. Rail transit is not yet developed in the urban area; hence it is not suitable for the trip. Honolulu International Airport is one of the busiest airports in the United States and it is the principle entry into Hawaii. The airport is located to 5 kilometers northwest of Oahu. It handles almost 21 million passenger traffic each year. This airport handles many domestic and international destinations. The busiest routes of domestic flights are between Honolulu to Las Angeles and international flights to Japan. Honolulu airport is the major hub for airlines like Hawaiian Airlines, Aloha Air Cargo, Asia Pacific Airlines, Mokulele Airlines and Island Air. Honolulu transportation including flying in and out of the Honolulu International Airport is easy as it should be. Renting a Honolulu Oahu car rental to explore the island or traveling about on an Oahu bus or Waikiki Trolley will get you from place to place, and couldn't be simpler or more fun!